There are some interesting flowers blooming in my garden at present. This tree has been growing for nearly 6 years but up till now has not flowered properly. 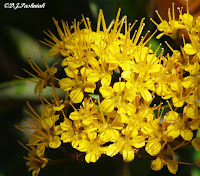 It is a Golden Myrtle or Metrosideros queenslandica. Although it is now about 3-4 meters tall it may eventually grow 4-8 meters. This is a large shrub or small tree -whichever you wish! It is a Blueberry Ash or Elaeocarpus reticulatus and occurs naturally in the bush around here. The birds don't seem to take much notice of the flowers but the blue berries which come on later are a favorite source of food. It is a dense and compact shrub at present. 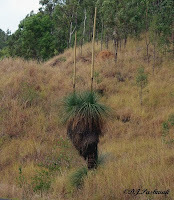 This is a grass tree which I saw growing out of the rocky hillside above Lake Somerset on the way up to Esk. I was on the look-out for tall growing specimens after reading the blog Denis posted about the ones he found. I estimated the main plant here to be at least 2 meters tall plus the flower stalks above. There is also new growth at the very base of the plant - a new plant or is it shooting out again from down there? This is one of the common grass trees from around here - Zanthorrhoea fulva - and would not be more than about a meter and a half including the flower stem. I found this NASTY creature - a Cane Toad - while I was out in the garden yesterday. For those who don't know - they were an introduced species that has been a disaster for Australia. Read about them here. My cat has been too sensible to ever get near them but I have had a couple of nasty episodes when the dog was young. 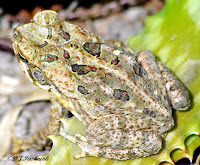 I was lucky not to loose the dog to a small dose of poison from a toad. Pied Oystercatchers are quite common around the bay but I seldom see the Sooty Oystercatchers as they prefer rocky headlands rather than the sandy stretches of the bay. I saw this Sooty Oystercatcher with the Pied Oystercatchers out at Inskip Point. While watching the other birds I could hear a constant 'peeping' sound which I tracked down to this juvenile Silver Gull which was begging for food from the adult. The adult ignored it but it persisted in following as closely as it could. 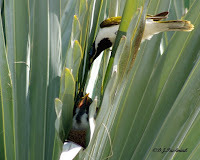 Honeyeaters in the Early Morning. 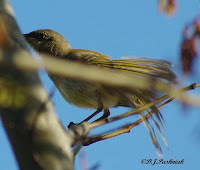 A few months ago I was very pleased to see and hear Brown Honeyeaters in my garden. At first there were only a couple of birds at a time but now I think they must have raised a family and brought them back to my garden to visit and to take advantage of all the flowering trees. 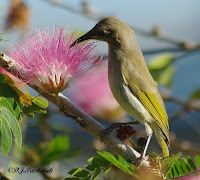 Most mornings now I hear them busily chattering and can see them flying around amongst the various trees and shrubs that are flowering right now. They seem quite used to me watching them and when I mimic their contact call which sounds like a little tongue click they look up but then simply get on with what they have been doing. This morning it is very bright and sunny and these are some photos I have just now taken. 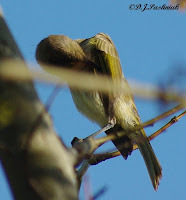 This bird sat just behind the branches and preened and then shook out its feathers. Having finished its morning 'brush-up' it needed some nectar. Sorry I don't know what the tree is - I grew it from one that had sprouted under a similar tree in a neighbor's yard. It moved around a number of flowers. Rather nice, I would think, to be able to choose the precise texture and flavor of an early morning feed! It looked right at me as if to say "Are you still there?" Yesterday was such a beautiful day - sunny again and not too much wind - so I decided to take the kayak and paddle out to the sand island at Inskip Point. Most times when I go out there I just take the camera and have a great time with all the photo opportunities. This time I took my spotting scope as well as I hoped to get a count of the birds. As I paddled out I could see large areas where the sand was closely covered with birds and was considering where I could get out onto the sand to set up the scope or if I should just drift in closely and stay in the kayak and count without the scope. However, it was to be neither! A couple of men came by in a small netting boat and first rushed close by the end of the island and put up all the birds, there then went around the other side and came close in while they let out the net along the entire length of the island. The result was that most of the birds flew up and I had views of several flocks with hundreds of birds in each. Some very small flocks came back down but most flew off to find somewhere that they would not be disturbed. Even the pelicans decided to stalk off and swim out away from the disturbance. (I counted 60 pelicans in this flock.) However, they soon realized that as the net was taken in again there would possibly be small fish discarded. They came back to the island and walked across the sand... then went into the water on the other side and made for the boat. I was not close enough to see how many fish they actually got but I would say that these pelicans are used to looking for free feeds this way. I took photos of the small flocks of shorebirds that had settled back down on both ends of the island. When I got home and put the photos up on to the computer screen I saw that I had taken photos of another Ruddy Turnstone in among the Eastern Curlews and the single Godwit in the photo. The flock at the other end of the island was mainly Godwits but there were some Knots as well. I am still not really sure of ID-ing Great Knot from Red Knot - especially when the photos were taken against the light! I think that the Knot with red down the front and belly area are Red Knot. I welcome help with this ID. 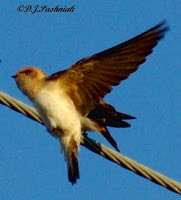 Yesterday, I was traveling in the car and had my camera with me when I saw this bird sitting on the electricity wires. Until now I have only had brief and distant views of these birds. The name comes from the blue-white wing spot seen under the wings when the bird is flying but this one did not oblige by flying and letting me see the spot. 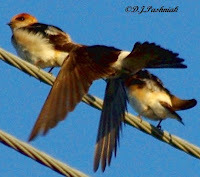 My birding book says they are summer migrants to Australia from Papua New Guinea and E. Indonesia. According to this news story looking at nature not only makes you feel better but even makes you a nicer person. Well, I know the first is true and it would be nice if the second were also true - but who knows? I traveled down to Nambucca Heads for my mother's funeral with my sister and it was quite a trip. We had a 4 hour wait on the highway only a short distance north of our destination as there was a car accident with - we heard - a double fatality. Like a lot of Australia's roads, the Pacific Highway leaves a lot to be desired! This stretch of the road is quite narrow and winding. Fortunately, there was room to turn out of the line of waiting traffic and go down the Hungry Head Road to Urunga where there were a few shops and cafes open to get drinks and food etc. Northwards - not sure if that is Urunga or Repton. The cemetery at Nambucca is beautiful enough to lift the spirits if anything could at a time like this! It is immediately above the ocean and all during the graveside service I could hear the sound of the waves. IMO Early town planners certainly had a good idea of what was appropriate. She saw a great number of changes in her lifetime and faced them all with determination and style. She and Dad were married 57 years and when he died 12 years ago things were just not the same for her. She loved doing things with us but the joy and excitement were all gone. We will all miss her so much. It's the end of an era! I have not until now posted wholly personal things on this blog but felt this to be an exception. Back to normal asap. I need to see some birds and beautiful scenery to give life some balance again! A very hurried post as I just want to record as soon as possible that this has been a very important week-end for shorebird counts in the Great Sandy Strait. It is four years since there has been a full count of all shorebird roosts in our area. We simply do not have enough counters. The QWSG (Queensland Wader Study Group) organized counters and transport and all the roosts have now been counted again. We 'locals' are grateful to all the folks who came from considerable distances away to make this week-end a success. I joined with a couple of the visitors - a delightful husband and wife team with such energy and enthusiasm! - and now know where to find one more important roost in the local area. 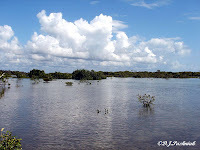 It is a wide shallow bay which we reached by pushing through quite dense undergrowth. Next time, however, I will definitely go in the kayak! 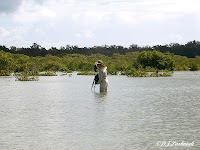 These are photos of the bay and the mangroves where most of the birds were found. Please notice the depth of water an intrepid birder will wade through in order to get close enough to count birds! In the early spring the Fairy Martins return to make their nests close by where I live. The birding books say that they nest in the ceilings of caves, in overhanging banks, and in road culverts and under bridges. However, the ones that come here like the eaves of some houses. I suspect that they check out any house where there is no activity outside. Just around from here there are several favorites. These are rental houses that quite frequently have vacant periods. In a very short time the birds will have made dozens of bottle shaped nests under the eaves. They make a terrible mess with the mud they carry in and with their droppings as well. The longer they are left the worse it gets. This year they had just started when the ones looking after the house discovered them and took the nests down. Then they perched on the electricity wires in the street waiting to see if they could start up again. When I walked around that way the other morning they had started again! 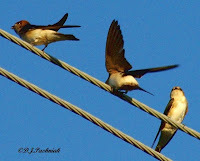 These are photos I took of the early nests they made and also of the birds perching on the wires along the road. 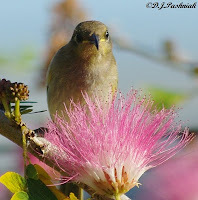 For more bird photographs visit the Bird Photography Weekly site. 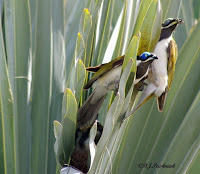 The other week friends called me around to their house to see a pair of Blue-faced Honeyeaters which had a nest in a palm tree in their yard. The palm is a Bismarkia. 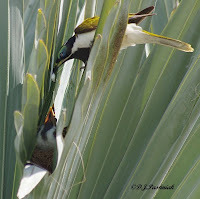 The palm frond was folded up - I don't know if the birds had managed this or how it had happened. The fronds on this same palm species in my yard open almost immediately they shoot up. 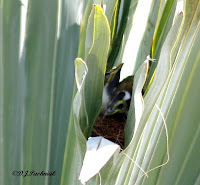 The birds had also managed to fold part of the frond down in the front to make easier access to the nest. I saw two nearly fledged chicks and both adults. As usual I took multiple photos. I saw an adult carrying away something white from the nest but when I examined the photos on my computer I saw this! I assume it is a faecal sack being taken away from the nest.